I finished this hat a couple days ago for a friend and it was too cute not to post. The inspiration came from this darling hat on etsy. This hat is knitted from the bottom up, starting with the ear flaps. The braid attached to the ear flaps is an 8-stranded square braid. 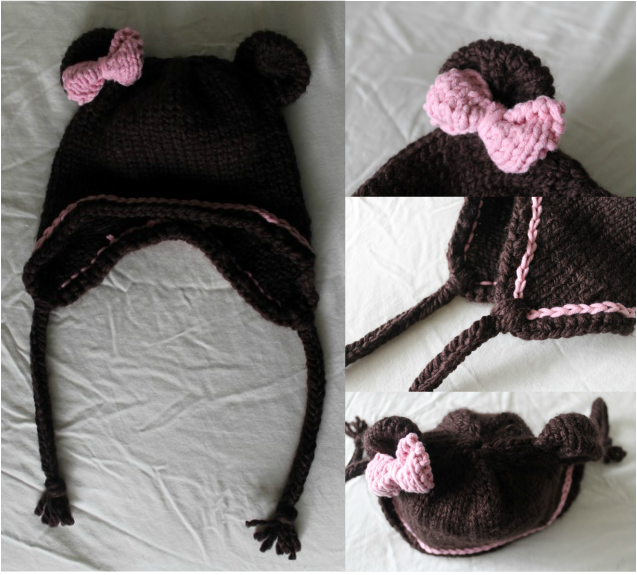 This hat is for a newborn (3-6 months) (6-12 months). If you would like a different size, adjust your needles and/or your yard. 10 rows is 2", 6.5 STS is 2"
Repeat Rows 1 and 2 until there are 15 STS (17 STS) (19 STS). Repeat Row 1 once more. Cut yarn. Push the ear flap out of the way of the needles and hold on the circular part. Being careful not to twist, connect for knitting in the round. Knit all rounds until the hat reaches 5" (5.5") (6") and switch to double point needles for the decreases. Cut a 6" tail and using the yarn needle, thread through the remaining STS and pull tight to close up the hole then go through the top of the hat and tie a knot inside of the hat. Weave in loose ends. SC around the edge of the hat with MC. Weave in ends. Using CC, SL around the base of the SCs just made. Weave in ends. Using MC, make 4 long strands for the braids (I usually just do the length between my hands outstretched). Fold in half and using the crochet hook, pull about an inch of the middle of the strands through the middle of the ear flap, then pull the ends through the loop just made. Cut the ends to about 3" past how long you want the braid to go, then do the square braid and tie a knot at the end. Trim up the ends if necessary. Cut an 8" tail and using the yarn needle, thread tail through stitches, sinch together and tie to secure. Use the yarn needle to thread original tail through cast on stitches (removing scrap thread as you go), sinch and tie to secure. Repeat the same process for the second ear. Use the tails to secure the ears to the hat. I got the pattern for the bow from Cornflower Blue. I did number 2, but I only cast on 11.